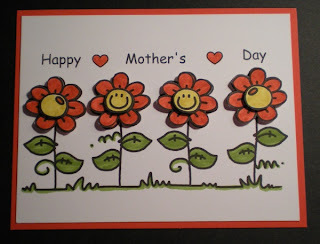 Happy Mothers Day to all my stampers out there. Have a wonderful relaxing day with your family. Fell in love with this little digi stamp from Bugaboo stamps and had to play a bit this morning with it. Used Poppy Parade, Daffodil Delight, Pear Pizzazz, and a smidgen of Calypso Coral. I did cut the flowers and the flower centers then popped them up. Not that you can see that in the picture but they are triple layered. Now back to get my tush back to working on the teacher gifts... School is out in a week my friends. Then its off to New Mexico for a little vacation. Mothers Day gift - Finished! A 6X6 Book for Leticia..